Homeless Pets Foundation is very proud of the fact that we rescue heartworm positive dogs. These dogs have little chance to survive in an animal shelter if they are positive for heartworms. Everyone at Homeless Pets Foundation would like to expand the dog rescue program for heartworm positive dogs. 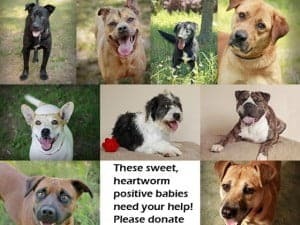 The barrier to doing more of these heartworm positive rescues is MONEY. The cost to treat each heartworm positive dog is $700 and we currently have 9 heartworm positive dogs in our program that need your help. With your tax deductible donation, Homeless Pets Foundation can help more heartworm positive dogs escape euthanasia at the shelters. After they receive the necessary medical treatment, dogs with heartworm disease go on to live long and happy lives with their new families. Please donate to our heartworm fund today; your donation will help us save precious lives. Please help us care for these dogs!